Within a joint Nordic programme organized by the Norwegian and the Swedish Embassies, the Viking Club invites you to attend the screening of two Nordic documentary films. 22 May at 8pm – a film about Olof Palme, the former Prime Minister of Sweden (English with Portuguese subtitles) – see below for details about this film. 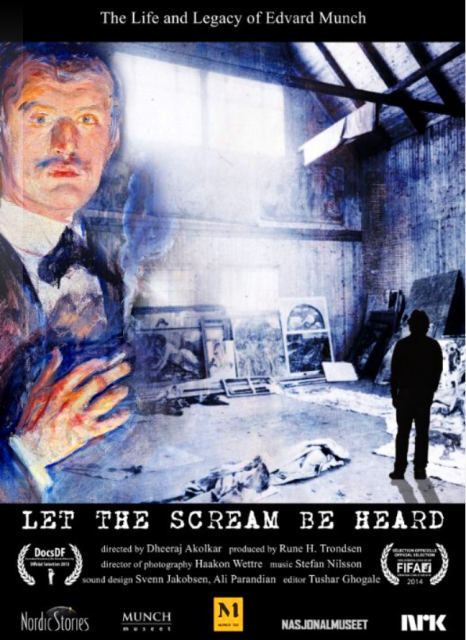 29 May at 8pm – a film about the world renown Norwegian painter Edward Munch (English with Portuguese subtitles) – scroll down to the next post for more details about this film. The Viking Bar will open at 7:15 PM and the movies will start rolling at 8:00 PM. You can download a map showing the location of the Viking Club on this website’s Join Us page. The Viking Club is on the main floor of the former Swedish Building at Rua Marien N”Guabi, No 118 in Maianga, across the street from the new Panela de Barra restaurant. 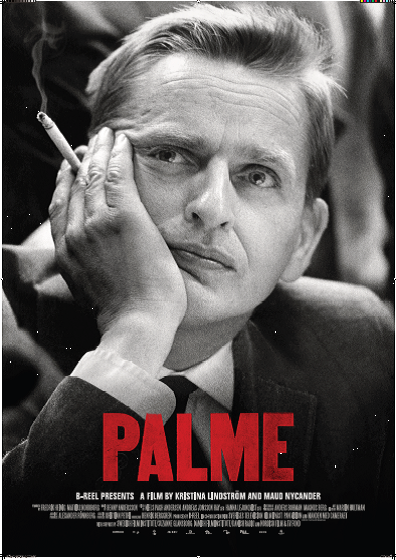 PALME –A 20th Century Tale, a film about Olof Palme, the former Prime Minister of Sweden. 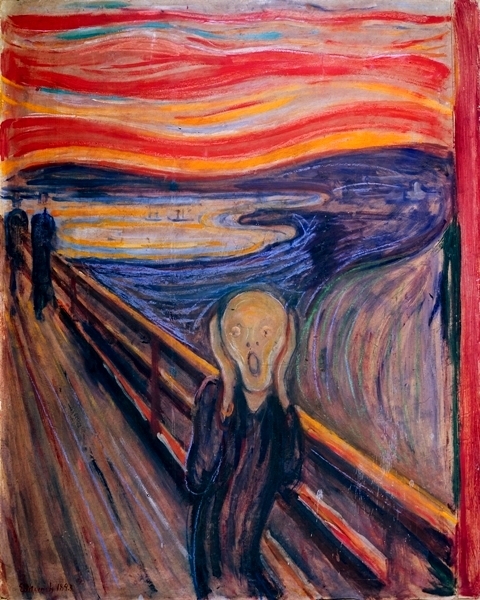 Synopsis: In 1986 Olof Palme was openly shot to death on a February evening on the streets of Stockholm. In one night, the country of Sweden was transfigured.The film PALME is about his life, his times, and about the Sweden he had created. Olof Palme was a boy from the upper-class who ended up creating the world’s most equal society. He was the tactician who was driven by his passion for social justice. Worshipped and hated beyond parallel. Neither before him nor after him has any othe politician resembled Olof Palme. Through Olof Palme, a minor country like Sweden affected major international politics. This film about Olof Palme is a journey through time, in pictures and experiences.The film uses never shown private footage as well as interviews with family members and former colleagues. The film was directed by the award winning filmmakers Kristina Lindström and Maud Nycander. PALME premiered in Swedish cinemas in September 2012. The film is 103 minutes long and will be shown with English narration and Portuguese subtitles. By popular request the Angola Field Group is showing the sequel to the documentary film that we screened last month, A Trip Down Memory Lane, a nostalgic look-back at Angola during colonial times, on Thursday, October 31 at 8:00 PM at the Viking Club. The second film moves to the provinces showing car races in Lubango, cotton farming in Malange, coffee fazendas in Uige, etc… Narration is in Portuguese with a sound track featuring Raul Endipwo. We will have a brief discussion afterwards. Everybody is welcome to attend. In close cooperation with the Viking Club, this event is offered free of charge. Beverages and snacks are sold at the Viking Bar which opens at 7:30 PM. Coupons must be purchased. You can download a map showing the location of the Viking Club on our website here. The Viking Club is on the main floor of Edificio Maianga, Rua Marien Nguabi, No 118 in Maianga, across the street from the Panela de Barra restaurant. For sale at the presentation: Just received, a batch of organic natural honey from the Mutti Farm in Moxico. Small and large handwoven baskets from the Zambezi Women´s Cooperative and also books about Angola. Luanda’s new marginal, construction completed August 2012. Photo courtesy Herman Calis. Angola has notched up 12 years of post war reconstruction. 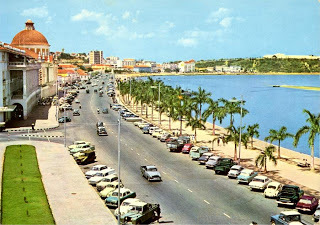 Ever wonder what Luanda and Angola were like pre-war? Back by popular demand, the Angola Field Group invites you to the film A Trip Down Memory Lane with introduction and commentary by Denis Sanche and Kelse Alexandre, members of the Angola Field Group team, on Thursday, September 26 at 8:00 PM at the Viking Club. The film is a nostalgic look back at Angola during colonial times: Bull fights in Luanda… Cotton mills and coffee roasteries…Herds of elephant and buffalo in Quicama Park… Narration is in Portuguese with a sound track featuring a well known Angolan singer of the ‘70s, Raúl Endipwo. Everybody is welcome to attend. In close cooperation with the Viking Club, this event is offered free of charge. Beverages and snacks are sold at the Viking Bar which opens at 7:30 PM. Coupons must be purchased. You can download a map showing the location of the Viking Club on our Join Us page. The Viking Club is on the main floor of Edificio Maianga, Rua Marien Nguabi, No 118 in Maianga, across the street from the Panela de Barra restaurant. Cleaning up the remnants of war so life can get back to normal for all. 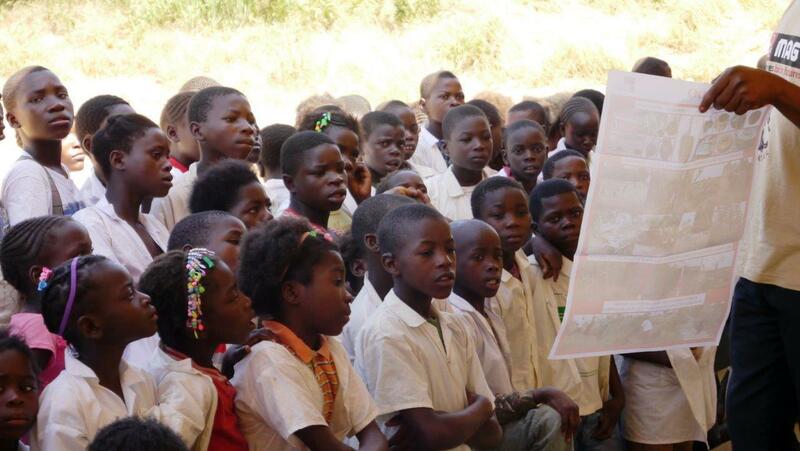 On April 4th Angola celebrated 11 years of peace. April 4th is also International Day for Mine Awareness. Long after the war is over, some weapons wait underground for years, a lurking threat. As one of the world’s most heavily land-mined countries, Angola still has over a decade of de-mining ahead of it. The Angola Field Group invites you to “Surviving the Peace, Angola”, a short film about an Angolan girl who played with a landmine; the film gives a close-up look at de-mining in Moxico province, at the Viking Club, Thursday April 11, at 8:00 PM. 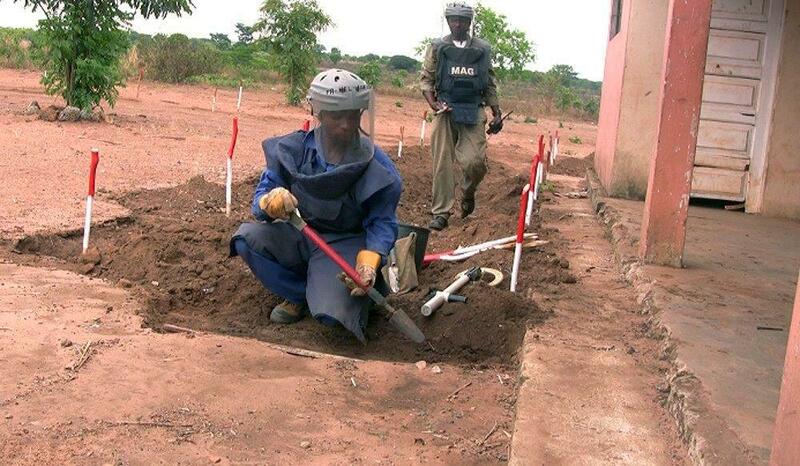 Wearing a helmet and visor and heavy vest and working one knee on the ground, makes de-mining especially challenging in hot climates like Angola. Our presenter, Tony Fernandes, is Technical Operations Manager/ Senior Manager in Country for MAG Angola, the NGO de-mining in Moxico province which is one of two most contaminated provinces in the country. Previously he managed de-mining work in Iran, DRC, South Sudan and Vietnam. Besides humanitarian mine action, Tony has extensive experience working in anti-terrorism and as a bomb squad operator and explosives inspector. The presentation will also include a short informative talk on de-mining in Angola in addition to the film, and an opportunity to ask questions of our presenter, Tony Fernandes. Also MAG T-shirts will be on sale. A lethal threat in his own backyard. 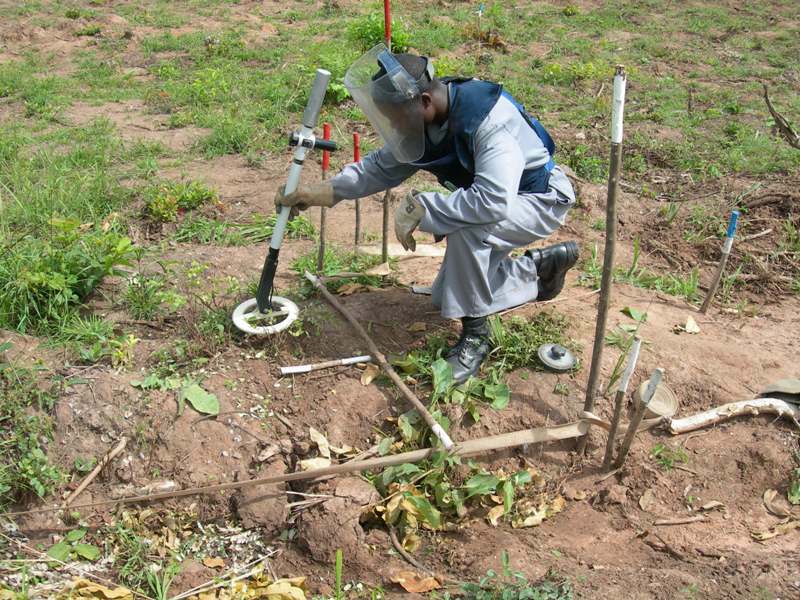 A resident shows MAG de-mining team a landmine. In close cooperation with the Viking Club, this event is offered free of charge. Beverages and snacks are sold at the bar, coupons must be purchased. The Viking Bar opens at 7:30 PM. The Viking Club is on the main floor of the Edificio Maianga, Rua Marien N”Guabi, No 118 across from Panela da Barro, on the same side of the street as the Suite Hotel. For a map, click here. For sale on Thursday, hand woven baskets from Moxico and various Angolan books. Also, giant used book sale of various English titles, fiction and non-fiction, a great selection! 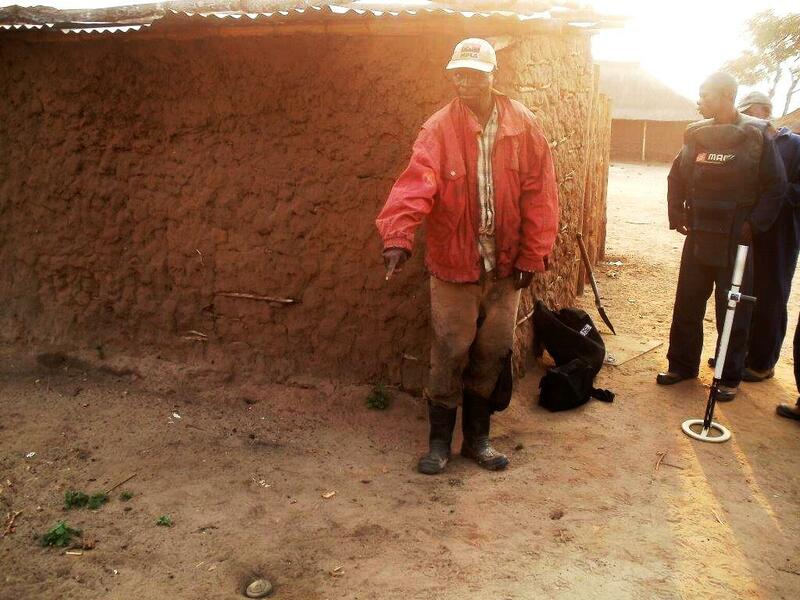 Moxico resident stares at yellow stick marking a landmine, a treacherous war souvenir in front of his house. MAG, Mines Advisory Group, is a British-based Non Governmental Organization based in Manchester, UK, founded in 1989 and has had de-mining operations in over 35 countries. 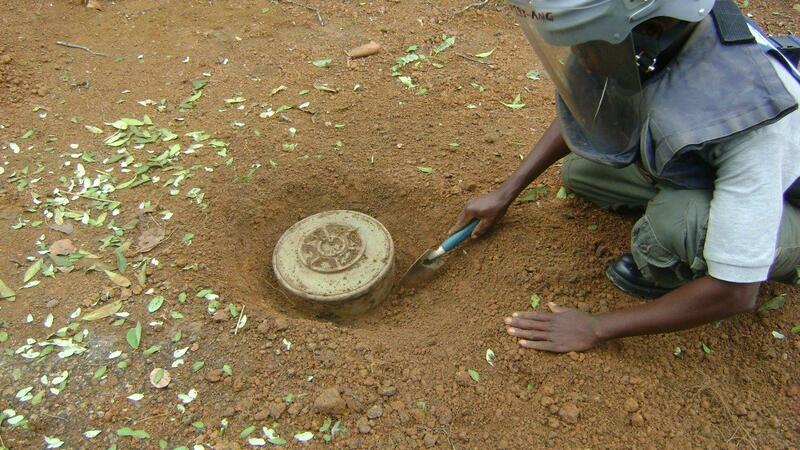 An important component of mine action is teaching mine awareness. 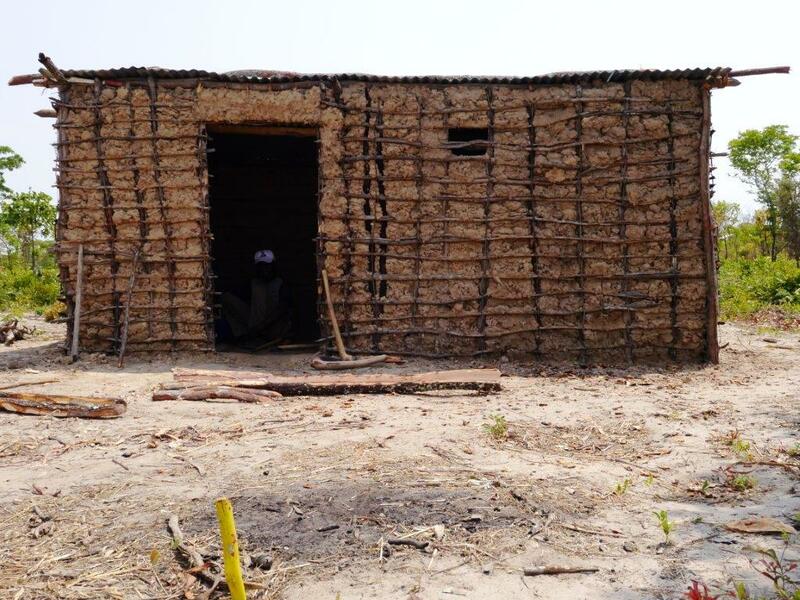 MAG team de-mining next to veranda of a local school in Moxico. All photos courtesy MAG. The Luanda International Film Festival runs from November 16 to 22nd at the Cine Atlantico. For full details and festival program visit the festivals website, www.ficluanda.org.